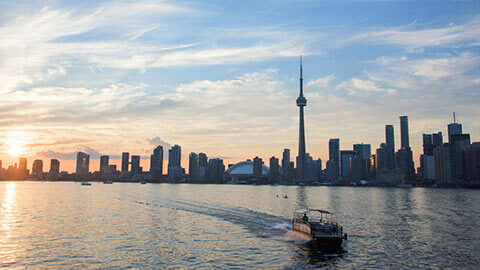 Toronto is a beautiful city located at the northwest shore of lake Ontario, Canada. It is the province capital of Ontario. The beauty and adventures of this city draws millions of visitors every year. Every adventure loving person must visit Toronto at least once in life. Toronto has rich cultural heritage, so it’s also a great place to visit for the people taking interest in different cultures of the world. There are so many things to do in Toronto like visiting amusement parks, Niagara Falls, museums, riverfront, art galleries, climbing CN tower, eating delicious food etc. Here is a list of some adventures a person can enjoy visiting Toronto. CN tower is the tallest tower in the world standing over 1800 feet in downtown Toronto. It is the tallest freely standing structure of the world and was completed in 1976. Here are some great things you can enjoy at CN Tower. a) Tourist visiting Toronto can enjoy the majestic look of city by riding up in a glass elevator to the top of the tower. b) It’s also a great place for adventure. Edge walk attracts every person who visits CN tower. It is an amusement in which a person seeking for adventure is strapped to the overhead rail and takes a walk around edge of the tower. The Distillery district is located on east of Toronto city. It’s a great place to know about the local culture and art. The Distillery district is a village like area away from downtown Toronto devoted to promote arts and culture, it’s full of restaurants, shops, art galleries, theaters, coffee houses etc to spent a memorable time. Here are some great sites to visit in Distillery District. a) Still Dancing- It’s a 36 foot tall sculpture constructed with steel and aluminum located at Trinity square. It is created by world famous artist Dennis Oppenheim. b) The koilos- It’s a fourteen foot tall handmade sculpture constructed by metal sheets. The creator of this sculpture is Michael Christian. The sculpture is very beautiful and sits with its legs ready to move forward. Art gallery of Ontario is a great museum of Toronto reopened in November 2008 for public. The gallery is extended in 45000 sq meters with more than 80,000 collections. Some of the best collections of AGO includes big collection of European art, Henry Moore sculpture gallery of arts, collection of miniatures and medieval decorative arts etc. Lake Ontario is a great place for those interested in swimming, sailing and fishing. The boats are easily available on rent, tourists can travel to the nearby Humber River and enjoy nature’s beauty. Tourists can also enjoy fishing in lake with poles, fishing rods or enjoy by stepping out in water. So these were the few reasons to go Toronto, there are many more. Toronto is a perfect place for people searching for adventure. There are many other great sites to visit. Interested to visit Toronto, apply through ESTA. Its will be a great adventure to a beautiful city.